This story was contributed by Martha Walker, retired newspaper and United Press International wire service reporter who also worked 22 years in corporate communications and market research. 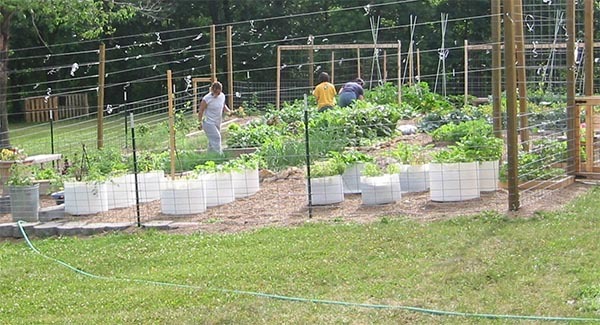 Back in 2005 when Kansas City Community Gardens collaborated with Harvesters Community Food Network and Kansas City Master Gardeners to create an inspiring “demonstration” garden near 39th Street and Van Brunt, few imagined the exponential reach and impact the 40-foot x 60-foot plot would have for people in the city. Coupled with Harvesters’ Plant A Row for the Hungry program, the garden inspires some of the organization’s more than 6,000 monthly volunteers to start container, raised bed and in-ground gardens, said Mary McClure, Missouri Master Gardener and former Chairman of Harvesters’ Board of Directors. 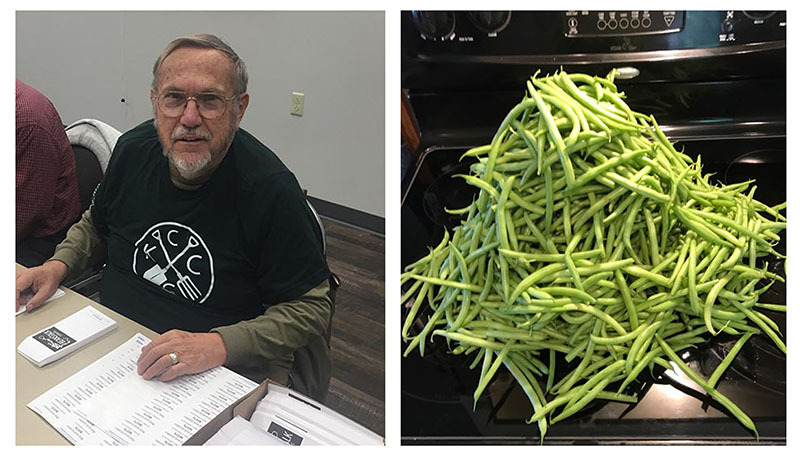 “Harvesters’ Plant A Row for the Hungry program does just that ─ encourages gardeners to cultivate a little more and donate all they cannot use to feed Kansas City’s people in need,” McClure said. “The program distributes planting packets to volunteers interested in participating. In the last year, area gardeners donated more than 10,000 pounds of fresh produce to help feed the hungry. Harvesters serves a 26-county area of northwestern Missouri and northeastern Kansas, providing food products to more than 620 not-for-profit agencies including emergency food pantries, community kitchens, homeless shelters, children’s’ homes and others. In the past year, Harvesters distributed more than 47 million meals to hungry people in the Kansas City region. Inspiring even the smallest gardening efforts among those who can do something helps stretch strained budgets further. In Harvesters’ service area in Kansas and Missouri, one in seven people is food insecure, meaning a person or household may have food today, but does not know if there will be food tomorrow or enough food for everyone in the household. More than 108,000 children under age 18 in the Kansas City region, or one in six, is food insecure and more than 40 percent are not eligible for federal food assistance programs. Harvesters works to close the food gaps. 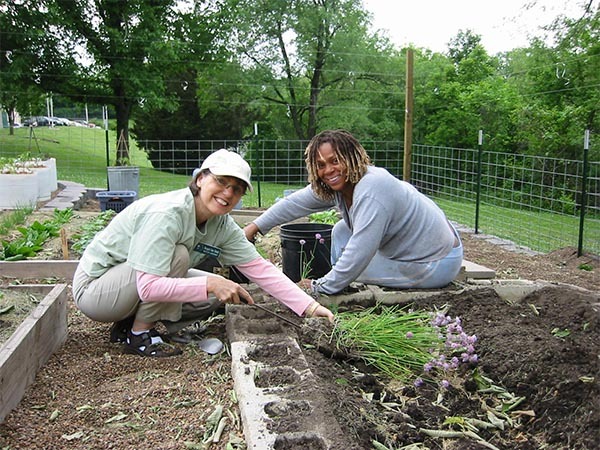 “We inspire gardening and connect people to access KCCG community plots or raised beds, seeds, plants, fertilizer, other supplies and education for successful gardening,” McClure said. KCCG provides seeds, fruit and vegetable plants for the Harvesters’ garden. Every Saturday during growing seasons, Harvesters’ volunteers and Master Gardeners descend on the demo garden to tend and pick vegetables and fruits that is all donated. “Produce grown in the Harvesters’ Kansas City garden goes directly to community kitchens, shelters or pantries handling fresh produce,” McClure said. “More than 1,000 pounds of produce were donated last year from our garden. And we have added coolers and freezers to take advantage of all the fresh produce offered to the food bank warehouse. 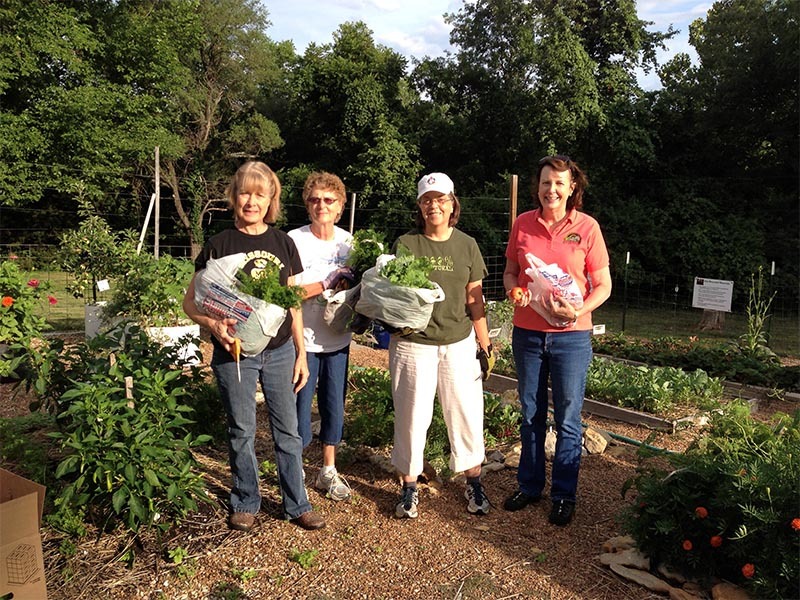 Many of the KCCG community garden partners donate produce exclusively to Harvesters’ pantries and kitchens. At Harvesters’ garden, people find brochures and other gardening education to start their own gardens. Harvesters’ experiment has now branched into edible landscaping to encourage even more Kansas Citians to garden and to help feed Kansas City. Previous StoryFall Garden To Do List! Next StoryOur Fall School Gardens Are in Full Swing! Schoolyard Gardens Celebrates 10 Years!